Window screens are beneficial parts of the window constructions. They are designed to protect the rooms from insects, dust and street dirt, trapping them or filtering out, keeping them out from your accommodations and offices. Meanwhile, wire meshes don’t prevent fresh air and sunlight penetrate into the rooms, being quite delicate and lightweight. Therefore, these beneficial accessories become contaminated betimes, letting less fresh air pass in, spoiling the window look, making you feel like looking through the dirty lens or spectacles. 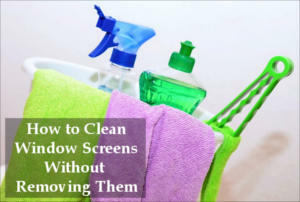 So, how to clean window screens without removing them? Yes, very easy! Thus, it’s advisable to clean the insect screens as often as possible, ideally every week, and enjoy a lot of sunlight and a picturesque view without any obstacles. Fortunately, it’s really easy to do, even without removing the wire meshes, if you have the modern, advanced, handy window screen cleaning tools like window squeegee or vac.